SFI Supplements are products that perform. We are the original show feed supplement company and have kept pace and adapted to many changes in the trends and types over the years. Since 1988 our products have lead the industry. SFI Supplements has worked to develop a product line that will elevate your show stock to it's highest potential in an all natural way. Our exclusive products are made with the most advanced technology available in the show feed and supplement industry. SFI products work! Just ask the exhibitors of the many champions that SFI Supplements has helped to put over the top. 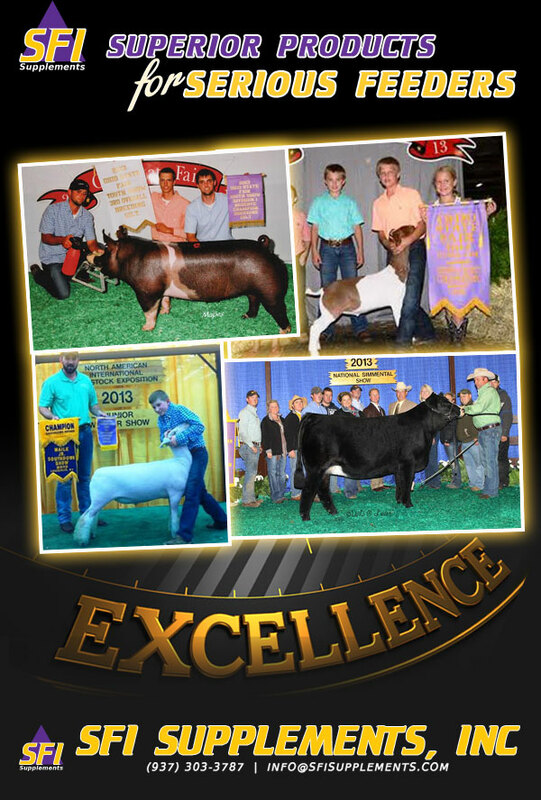 We would love to add your name to the list of professional showmen, veterinarians and ag. instructors that have experienced the SFI difference.